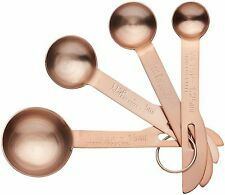 Kitchen Craft Set of 4 Copper Finish Stamped Measuring Spoons - Tsp, Tbsp, ml. 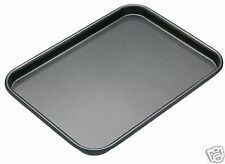 Kitchen Craft Individual Baking Tray. It is also designed to fit within other sizes (39cm baking tray - KCMCHB3)for maximum flexibility. Kitchen Craft Stainless Steel 12cm Fish Bone Tweezers Remover Pincers. Pendeford Stainless Steel Colander SS023. Stainless Steel. Kitchen Craft set of two stainless steel rings for making perfect fried eggs. Blister carded. Complete with fold up / fold down handle for easy removal and storage. Kitchen Craft Set 3 Rocking Horse Sugarcraft Fondant Icing / Biscuit Cutters. 500 (2 Packs) Spare 8.5cm Wax Disks Discs For Home Made Burger Press Maker. Kitchen Craft Round Linzer Biscuit / Cookie Shortbread Cutter Set. Effortlessly mash potatoes using the professional stainless steel potato masher. Ideal for creating and baking cream horn pastries and cakes, this set of six cream horn moulds are made from stainless steel and neatly stack inside each other for easy storage when not in use. This item forms part of the Master Class award winning bakeware collection. Kitchen Craft Acrylic Criss Cross Cake Decorating Fondant Icing Rolling Pin. Set of 2 - 13cm & 18cm - Kitchencraft Stainless Steel Mini Cooking Mixing Whisks. Kitchen Craft MC Non-stick Loose Base Sandwich Sponge Cake Pan Tin 6" 7" 8" 9"
Kitchen Craft New Sweetly Does It Cake Pop Metal Mould Baller Maker Tool. Kitchen Craft Adjustable Chrome Oven Roasting Roast Meat Rack Trivet 29 x 28cm. Kitchen Craft 18cm Stainless Steel Butter Grater Knife Sandwich Spreader. 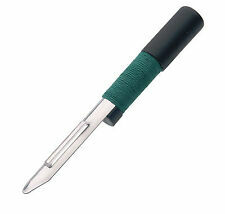 Kitchen Craft 20cm Sandwich Spreading Spreader Butter Knife. Kitchen Craft 45cm Long Magnetic Wall Mounted Knife Rack & Holder Inc Fittings. Kitchen Craft Microwave Baked Jacket Potato Baker Holder Stand. Kitchen Craft Double Serrated Edge Grapefruit Serving Curved Fruit Knife. Kitchen Craft Set of 10 Stacking Measuring Cups - Tsp, Tbsp, Cups, Spoons. New Kitchen Craft Draw Through Cheese Wire Cutter & Handles. Set Of 2 Kitchen Craft Orange Peel Removers Skin Peelers Scorers. Kitchen Craft Flexible All Purpose Bowl Pastry Scraper. Kitchen Craft Traditional Stainless Steel Single Tea Towel Holder Clip Rail. Kitchen Craft Silicone Coated Cake Tin Lining Baking Parchment Roll - 25m x 10cm. Kitchen Craft Sugarcraft Cake Icing & Decorating 10.5cm Tongs Tweezers Pincers. Kitchencraft Healthy Eating Serrated Edge Grapefruit Serving Curved Fruit Knife. Kitchen Craft Quantum Silver Non Stick Fluted Loose Bottom Quiche Tart Tin. Kitchen Craft Heavy Duty Steel Foot Operated Floor Recycling Tin Can Crusher. Kitchen Craft Serrated Edge Stainless Steel Grapefruit Spoons x 2.